Hi there, happy Friday. How did your week go? I feel like I got a lot of stuff done. I've sewn all my rows together for the Easy Addition quilt and it's now a quilt top waiting to be quilted. I added my borders to the Pie Cherries quilt and I'm pretty excited about how it turned out. I also stitched the side borders onto my Scrapbasket quilt.. but I'm on the fence about my choices so I'm setting that aside. I've checked it off the list but I might have to uncheck it and try something else. Hopefully this weekend I can find some sun and get a few photos of all these projects to show you. No surprise I got sick of my list though. I have one more quilt that needs borders and I just didn't have it in me to do it. 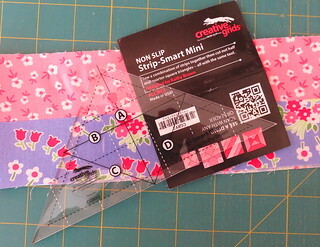 So I took a bit of a sewing holiday and pulled out my Strip Smart Mini that my friend Kathy sent me. Kathy designed this template for Creative Grids. I'm telling you it's genius, just like Kathy. You might remember she's written two Strip Smart books, Strips Smart Quilts and Strip Smart Quilts 2... you can make mini version of all those quilts with this template. She's also designed new patterns to go with this template, you can take a peek at those here. And there's a video and instruction page that includes more blocks and ideas here. I cut myself two 2 inch strips and stitched them together. Kathy recommends starch, as there will be bias edges. Then it's just a matter of cutting you pieces. One strip set yields 10 pieces if you cut them as I've shown here. If you watch the video you'll see there are other ways to cut the strip up. I'ts pretty amazing. I love this block, is it the double hourglass block? I don't remember the official name. So fast and simple. I pressed all the seams open. I also made a block stitching the to long edges together to yield a square. I hope you go watch Kathy's video, or if you have the Strip Smart books, pull them out for ideas. 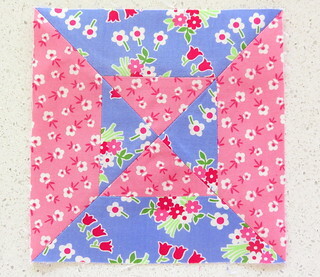 I loved the double hour glass quilt in the strip smart book, called Penny Candy. You can catch a picture of it on my blog post here. My books have a new life with this template. One thing I really like about the Creative Grids rulers is the little booklet that comes with them. I usually store my ruler with the booklet just in case I need help remembering how to use it. So that was my fun activity yesterday afternoon. But then I'm back at my list. What did you do this week? Have a good weekend! Can you believe it's the end of the month already?? Really Pam! I was like...oh look...squirrel! Even went to the older blog posts! I am also trying to work through a list this week. Today Christmas blocks go up on wall I hope. 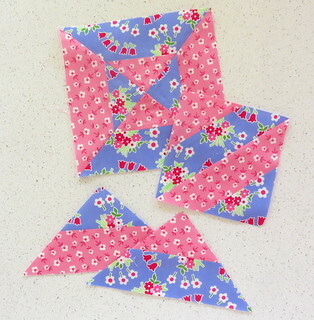 Yesterday I kept playing with these cute Sweetpea pouches with quirky zipper. Have a great weekend, can't believe May is nearly here! Beautiful colour and fabric combinations! You sound very busy and have got loads done! Happy weekend.